Organic mixed greens with veggies, avocado, sunflower seeds, dill, and sprouts. Topped with our house goji dressing and vegan walnut parmesan. 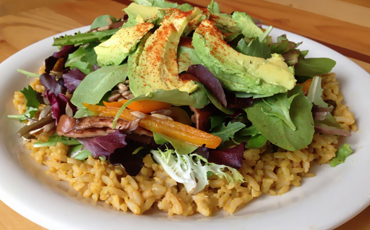 Organic mixed greens with sliced marinated portabella/zucchini/bell pepper, avocado, mango, sunflower seeds, toasted walnut, and house goji dressing. Sits on a bed of spicy basmati rice cooked with chili morita and avocado cheese. 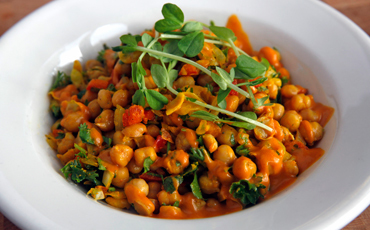 Cooked garbanzo beans, bell pepper, onion, cilantro, parsley, garlic, lemon juice, olive oil, and spices. 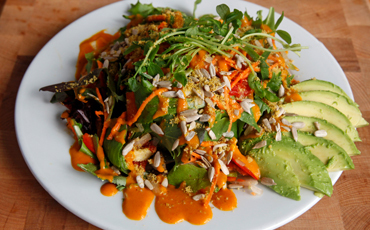 Topped with house goji dressing, dill, and sprouts.